Big Brother is Watching You Been telling my husband for years that Facebook is a tool of the CIA. He laughs. I would laugh the last laugh if it wasn’t so very sad. In another story, Arizona AHCCCS residents lose preventative care coverage. Well, isn’t that short sighted. So now we’re going to pay millions more for crisis and debilitating illnesses when we could have just paid for the preventative care instead. And we’re going to pay for hundreds of thousands of children, long term, who will not have the benefit of having their parents be productive, or even alive. Greeeaaat. Why is it that the low cost, easy things to cover are the ones that get ignored and pushed to the wayside? Mandelbrot was a visionary mathematician in the tradition of exploration of our world via math and science that dates back at least to Ur and probably earlier. He is very much in the tradition of those visionary wizards, healers, and holy men/women who, via their insights (some discovered via the use of mind altering drugs) assisted humanity to live better lives both spiritually and physically. He reminds me of a modern day ceremonial magician, the precursor of our modern scientist; although I’m pretty sure he didn’t draw protective circles on the floor of his workroom and conjure up spirits to give him assistance….Al Jibbr, Newton, and Copernicus would have been proud to see the development of their work in this way. He brought back the essential understanding of the whole contained in each part, and each part expressing the whole. This understanding was forgotten during the Enlightenment period and is responsible for the progression of the Industrial Age. After all, if the world is merely an automaton, with no inherent life and no sacredness, exploitation by its very nature is no sin. Things only have value relative to their ability to be used, from people to land, to minerals and other species. This is why we’ve used up most of the value and have the mess we have now. Mandelbrot brought back the sense of the whole, the old time Pagan sensibility that the part is more than a piece of the whole, even if you don’t understand quite how, and that what affects one part affects the whole in ways you probably won’t understand for quite a while. It reminds us that we are a part of the whole, and reflect the whole in our being, from cell up to organism. Mandelbrot’s work makes the work of experimental and theoretical physicists possible in many ways, because it allows the ‘messiness’ of the real world to be mathematically accounted for. This article about entanglement and the possibilities it raises about the nature of the whole to the parts, merely reminds us that those ancient pioneers were on to something, that they were paying better attention than many of our best scientists over the last 150 years. It brings us back to an earlier time in the circle, or spiral if you like. Same song, new verse. He died earlier this week, and in the best tradition of our collective history of ancestor worship, deserves to become a demigod or at least a saint. I’ll be lighting a candle in his memory when we remember the ancestors later this month. Thank you for the life work, and good journey to you, Mr. Mandelbrot. This is weeks late, I know, but I’ve been busy with other stuff taking over my life. Not bad; a second place for my sweater, which is really pretty good for my first knitting WAG type project. I have always taken patterns and altered them but never made one up based on a suggestion. 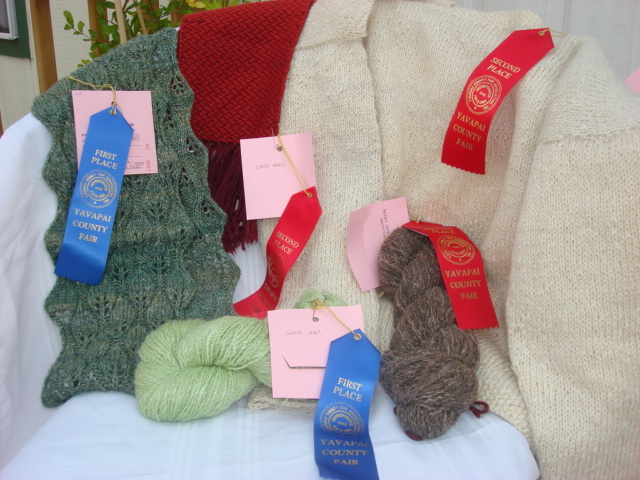 One of my skeins of yarn got first and another got second; ditto for my scarves. The hand spun hand knit one got first, my first weaving project got second. All in all, it gives me hope that I might be able to sell stuff here and there — at least, my work is quality is what I mean. Whether I can actually sell stuff remains to be seen. It would be nice to at least make it self sustaining; my goal is though to be able to reduce my hours working at my ‘real’ job so I could work more from home. At first glance, it doesn’t seem very doable, BUT… when you factor in gas to and from work, buying drinks (even though I mostly drink the free coffee and water), and lunch purchases (because I’m not home enough to make all my lunches all the time) as well as wear and tear on uniforms and shoes, and laundry expenses it might end up breaking even. For at least one or two days a month less. And who knows, if the economy takes another nosedive as I suspect it might, working less might make me more attractive to my bosses and less likely to be forcibly cut. I do know that part time people have access to all the hours they care to have. And then again, if the economy takes another nosedive, nobody will have money to spend on quality anyway…. The garden has done very poorly so far this year. I’ve put up about 20 lbs of tomatoes from the garden the whole of this year and have maybe another five that will be ripe before the first frost comes due at the end of the month. No peppers, a few eggplants, one bunch of grapes from my own vines, and the raspberries are dying. The one thing that has done very well are the lima beans. From a 2 x 3 plot I got about a cup of beans. I think that is a pretty good return from a little package! Those are definitely keepers. They’ll get planted again next year. The swiss chard is finally doing well after suffering in the heat all summer long, and the collard greens are still thriving. We don’t care for them much (the only recipe I’ve found for them involves cooking them for hours in a pork broth and serving with cornbread) but the chickens absolutely love them so I’ll grow them again just for them. After two months with no eggs at least two are producing again. It will be time for new chicks in the spring, I think. Much as these hens have been pampered, if they’re past their prime and not giving us what we got them for, it’s time for them to go to the chicken retirement home in favor of some younger girls who will produce reliably for us. After all, we’re supplying our home entirely from our eggs, and two relatives regularly from our girls. We need the production! My plan is to rip all the plants out of the beds after the first frost and to manure and mulch heavily with straw, and let it sit over the winter with no winter gardening at all. Hopefully increasing the fertility and tilth will help counter any future wacky weather issues like we’ve had this year. I also want to get rid of my trash container composters and to build an actual cinder block compost unit. I think part of the reason I don’t get hot enough temps in my compost to kill seeds is because I don’t have a critical mass of compost in one spot at any given time. If my three barrels were combined into one bin, I think it might be enough to get good compost faster. That’s all the updates for now. Off to cut out DH’s Halloween costume and hopefully to go to a birthday party later today. This is a sample of Cascade 220, a 100% wool yarn, the first yarn commercially produced that gives a living wage to the sheep herders of Peru. It’s lusciously soft, and Mr. TF and I picked up about 10 skeins of this yarn in the above ghastly color at a closeout sale for a killer price. This yarn is NOT cheap, but I got it all for I think $30 or some ridiculously low price. The color of course is the problem. I kept thinking I would find a project I could live with the color in; I did end up making a shawl that I gave away but I still had multiple skeins of this left over. Several months ago I got some Wilton’s cake dyes from another person on Ravelry; she was having a baby and wouldn’t have time to play with dyes for a while and didn’t want to see them go to waste. I got like 20 colors for a very reasonable price and thought that if they didn’t work out, I wasn’t out very much money. 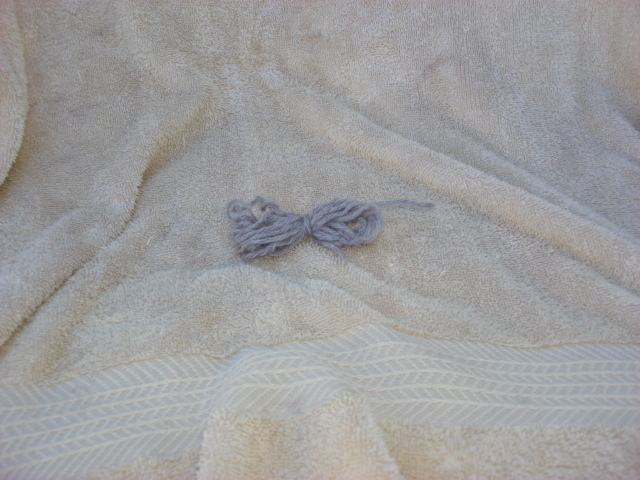 Last night I finally made the connection….ugly yarn, non-toxic dyes…why not? I already hate it, it can’t get any worse. So I over dyed it. And above is the result. Now this I can live with! 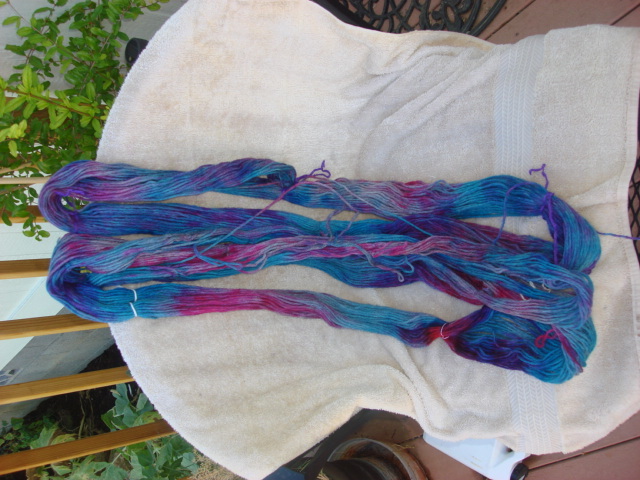 I used four colors and eye droppers to soak the yarn. In places, it didn’t completely cover the grey, but instead of being ugly it looks like it’s part of the design of the yarn. I can’t wait to make something with this! Governnor Schwarzenegger signs budget that eliminates aid for the poor. Which means we’ll be getting wave after wave of people coming to Arizona in search of benefits. Get ready, the ride is going to get rough soon.